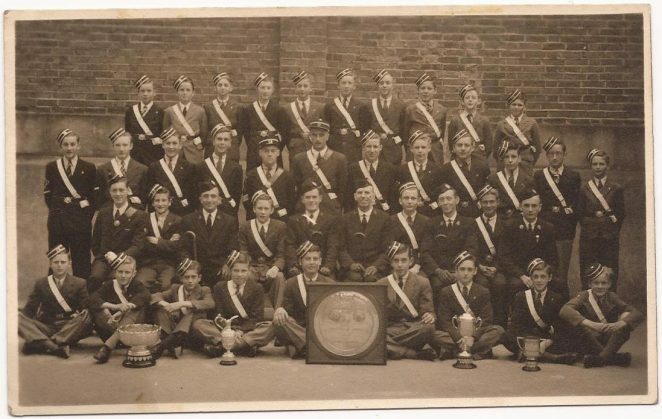 This photograph of The 13th Brighton Boys’ Brigade, based in a church in Lewes Road was taken c1945. As you look at the photo, the boy sitting on the floor on the right side next to the square trophy was my father Raymond Barrow. Iin the second row from the back, again on the right as you look at the photo, 3rd from the end, was his brother Norman Barrow. Does anyone have any memories of the Boys’ Brigade to share? Please leave a comment below. In the 60s I was a member of the 30th Boys Brigade, we were based in The Barn at Patcham. I remember going on several Church Parades around Brighton. Happy Days. Hi Alan, my father, Ebenezer Charles Snelling 1904 – 1964 was in the 13th B’ton Boys Brigade, probably around the WW1 period. I was in the BB at Hollingbury/Patcham and went to camp at Glynde. ”Bumble” Griffin was captain and Les Harris (the coal merchant) a lieutenant.